“A carer is anyone who cares, unpaid, for a friend or family member who due to illness, disability, a mental health problem or an addiction and cannot cope without their support. 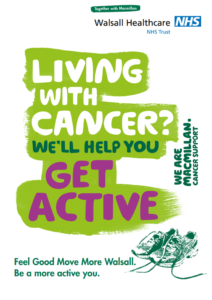 Taking part in physical activity during and after cancer treatment can make a big difference to a person’s clinical outcomes and quality of life. That’s why Macmillan has a free scheme in Walsall called Feel Good Move More Walsall to help people get and stay active at a level that suits them. I consent to the following information being held on the practice’s computerised electronic database. Carers are relatives, friends or neighbours who regularly look after someone in need of help because of illness, frailty or disability. The help they provide is unpaid. Carers may be adults, children or young people either living with the person they care for or somewhere else. then you are a carer – and you are not alone. Over 10,000 people in Walsall said in the 2001 census that they provided care to someone for over 20 hours a week. If you are a carer then you are entitled to a carer’s assessment and can ask social services for help to meet your own needs. For you to receive any service, the person you care for will have to have enough needs to be entitled to help from social services, but they do not actually have to be getting that help. Sometimes people talk about ‘informal carers’ to distinguish you from people who are paid to provide care to people. People also talk about ‘family carers’, and while it is important that we make sure spouses and children are seen as carers, you do not have to be family – you may be a friend or a neighbour. The care you give may include physical and personal care, emotional support, advocacy, or maintaining safety. Many carers have skills and experience which would be valuable to employers but they don’t always see themselves that way. Carers who have lost opportunities to train for employment might not see a way back in. Too often isolation and the caring role can undermine confidence and limit choices. The Work and Families Act came into effect in April 2007. It gives unpaid / family carers the right to request flexible working. This means carers have a legal right to request flexible working, and their employer will have to show that they have taken the request very seriously. What help is available in Walsall? Steps to Work and Work on the Horizon are two local organisations who can provide carers with help and support about the free training and employment opportunities available. Individuals seeking employment but who may need training to secure a job are assisted with courses, subsidies for clothing, travel, child care and equipment. Practical work qualifications can be achieved during this project and job search support is offered at the project centre. All participants must have been unemployed for six months or longer or be part of a prescribed group. Training available includes LGV, PCV and fork lift truck courses which lead to licenses being gained and ultimately sustainable employment. Contact us For more information contact Steps to Work. Work on the Horizon is the one stop employment and training programme for residents of the Walsall New Deal for Communities area. They deliver the Training for Carers project which offers a free package of support to full and part-time carers who may be considering some form of employment or training but may lack the relevant skills that employers are looking for. We may be able to give you some advice or information. We may be able to suggest places to go to get advice or help. We may be able to offer support to the person you care for, in order to help you. We may be able to increase support to the person you care for, in order to help you. We may be able to give you some help for yourself, for example around your health needs, at home, or to work, learn, or relax. You may want to make sure we know about what you do, what support would be needed if you could not carry on caring, and who else might help in an emergency. Many people say that they appreciate just taking the chance to stop and think about what they do, and what they might want to do apart from caring. Sometimes people slip into only seeing someone as a carer, not as a person who also cares. There are two ways we can assess your needs for support – as part of assessing the person you care for, or in a separate carer’s assessment. If you have a ‘shared assessment’ you can still ask for one for yourself. If a social worker comes to see the person you care for to assess their needs and possibly arrange help for them, they should ask you whether you need help to carry on caring and plan ahead. If that brief discussion is all you think you need then that shared assessment should include any agreed support to help you. A shared assessment will normally mean talking about your needs in front of the person you care for, which some people are very happy to do, but some people may find this difficult or limiting. You may be identified as a carer, by yourself or others, before during or after the shared assessment. At any point when you are identified as a carer you should also be offered a separate carer’s assessment for your needs. Whether or not you have been part of a shared assessment, you can request a separate carer’s assessment by contacting the Walsall carers office. This can include situations where you are planning to care for someone in the near future. This can be because someone’s needs are increasing or when they are expected to come home from a period in hospital or residential / nursing care. This is your right under the law – under the Carers (Equal Opportunities) Act 2004, local authorities are under a duty to offer and carry out carer’s assessments. This must not only consider how you carry on caring, but what effect this has on your ability to have a life outside caring – to work, to learn, and to have some leisure activities. do this with a friend or someone to support you. You can also take some time to think about what you do, what your needs are, and what might help you now or in the future. Walsall Carers will give you a self-appraisal form to help you to reflect on this, and to feel prepared for the questions you will be asked. If services are provided to the person you care for then they will be included on their care plan. If services are provided directly to you, then you will have your own care plan to show what the Walsall carers scheme will arrange for you, when, and who from. Whether you have had a shared assessment, or separate carer’s assessment, this should be reviewed every year to see if your circumstances or needs have changed. It is also a chance to see whether any new advice or service has become available since your original assessment. If your needs have changed significantly in the meantime, you can request a fresh assessment. It does not cost anything to have an assessment, but there may be a charge for some social care services. At this time, any service provided directly to a carer via a carer’s assessment is exempt from charging, but a service delivered to the cared for person may require them to contribute. For more information about charges please see the Fairer Charging web page, or contact the Public Information Officer on 01922 658368. Support to a carer can also be through a Direct Payment. This means you receive the money from us to arrange your own support, in order to meet that need. This may be about a one-off purchase or some on-going help, and there is guidance and support made available for you to manage the money. To find out more go to the Direct Payments web page, ask for the separate leaflet from your local social work office or ask your social worker. You can contact us in person, by letter, telephone, email or ask someone else to contact us on your behalf. An interpreter can be arranged if English is not your first language. If you are deaf, text phones are available and sign language interpreters or lip speakers can be arranged. Need help with a chance to relax? Always meaning to try to keep fit? We have an extra little incentive! If you are caring for someone in your family, or a friend, then during 2008 you can have up to 20 sessions in one of Walsall’s borough leisure centres for free! This could mean free Mint Condition gym membership for 20 sessions, including induction or up to 20 free swimming sessions. With a carer’s assessment or membership of the Walsall Carers Centre , you can get a letter to bring to any leisure centre and set up your free membership. Make that resolution – and contact your social worker or local office or ring the Walsall Carers Centre on 01922 636663 to join the scheme. This scheme is sponsored by Sport and Leisure management in partnership with Walsall Social Care and Inclusion. Do you need a break from caring? Whether you are caring for someone in your family or another relative, friend or neighbour – at home or some distance away – there will be times when you need a break. What is a break from caring? For carers it is time away from the responsibilities and tasks of caring for someone. It can be as little as an hour a week or as long as a couple of weeks. Having a break can help you cope with other responsibilities such as family or other commitments, shopping, work or to spend some time doing something just for yourself. How and where can breaks be provided? Breaks can be provided in your home or the home of the person you look after. This might be provided in the form of a sitting service, befriending scheme, home care agency, live in help, or someone you know locally or even employing your own carer or carers through a Direct Payment. Breaks can also be provided in other people’s homes, for example fostering, adult placement scheme, childminders, supportive family and friends. Young carers are ordinary children or teenagers of both sexes, from all sorts of families, backgrounds and ethnic origins, who look after or help look after someone in their family – a mother or father, brother or sister, or granny or grandad. They may do most of the caring or just help out, but they may not see themselves as carers. Young carers undertake a number of tasks for the people they help look after. Young carers are often left alone to do things like washing, cooking, shopping, dressing, keeping someone company and much more. Other responsibilities include things such as making sure that the correct medicine is given to the person receiving care, taking charge of the household finances or looking after younger brothers and sisters. What support is there now? This is a chance to have fun, but also meet other young carers and staff who can help further. The project is run by the Walsall Carers Centre.